Xiaomi is all set for the launch of Mi TV 4A series 40-inches TV in India on March 7th, 2018 from 3 PM onwards after the launch of World's thinnest LED TV named as Mi LED Smart TV 4 which is priced at Rs.39,999. The device packs a 1.5GHz 64-bit Cortex A53 quad-core processor with 750MHz Mali-450 MP3 GPU. The MIUI TV is based on Android with PatchWall and has a 40-inch (1920 x 1080 pixels) Full HD display. The Mi TV 4A 40-inch comes with 1GB of RAM and 8GB of internal memory and It support wall hanging. It also features a 2 x 8W speaker, DOLBY AUDIO / DTS- HD audio dual decoding. Connectivity options on the device include WiFi 802.11 b/g/n, 2 x USB, Ethernet, Bluetooth 4.2 LE, 2 x HDMI, AV. 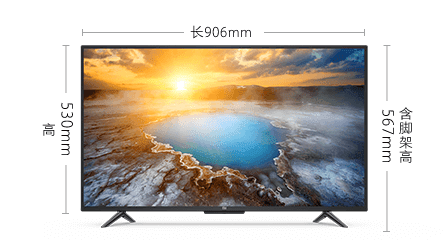 The Xiaomi Mi TV 4A 40-inch is available for pre-booking from today, i.e. from March 3rd to 5th and the device will go on sale in China from March 6th. The Mi TV 4A 40-inch price in China is 1699 Yuan (approx Rs.17,450 / US$ 267). Customers will get a 100 Yuan discount for those who pre-booked the TV, so the Mi TV 4A 40-inch will cost just 1599 Yuan (approx Rs.16,420 / US$ 251). The Xiaomi Mi TV 4A 40-inch is expected to be available in India from March 7th, 2018.